Government officials and religious liberty experts from as far away as Russia, Jordan, Spain, Zambia, Australia and Korea have begun arriving in the Dominican Republic for an international gathering of religious freedom advocates. 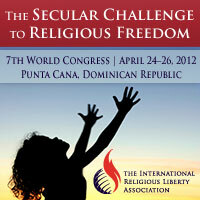 More than 800 people from some 60 countries will attend the three-day World Congress for Religious Freedom that begins Tuesday, April 24, in Punta Cana. “I know of no other event such as this that brings together such a large and diverse group of people dedicated to promoting one of humanity’s most basic freedoms—the right to believe, or not to believe,” says John Graz, General Secretary of the Washington D.C.-based International Religious Liberty Association, which is organizing the event. Among those attending the Congress include Ambassador Robert Seiple, the first US Ambassador-at-Large for International Religious Freedom and Secretary Sergey Melnikov from Moscow, who represents the office of the president of Russia. Other government officials attending include Senators Aurekio Iragorri and Charles Schultz, both from the Republic of Colombia, Prime Minister Gerrit Schotte of Curacao, and The Honorable Brent Symonette, Deputy Prime Minister and Foreign Minister of the Bahamas. The event is also attracting a wide range of religious leaders of many different faiths. Dr Neville Callam, General Secretary of the Baptist World Alliance, will address the Congress on Thursday, along with Dr Larry Miller, Secretary of the Global Christian Forum. Dr Ted NC Wilson, president of the 17 million-member Seventh-day Adventist Church, is also scheduled make a major presentation on Thursday. The World Congress, held every five years, brings together jurists, religious leaders, scholars, non-governmental or and religious liberty advocates. The theme of this year’s event, “Secularism and Religious Freedom—Conflict or Partnership?” highlights an area of increasing concern for religious liberty advocates. The event is organized and sponsored by the International Religious Liberty Association—a non-sectarian organization, chartered in 1893, dedicated to defending and promoting freedom of religion for people of all faiths. For daily news and video updates, visit http://www.irla.org.